It was probably already a foregone conclusion for most music fans, but expect Adele to blow viewers away during the Grammys next month. CBS announced on Wednesday that the “Hello” singer would be performing during the 58th Annual Grammy Awards on Feb. 15, along with The Weeknd, Kendrick Lamar and country band Little Big Town. Additionally, the Recording Academy will pay tribute to Lionel Richie as the 2016 MusiCares Person of the Year. LL Cool J is returning to host music’s biggest night of the year at Los Angeles’ Staples Center. CBS will broadcast the ceremony live starting at 5 p.m. PT/8 p.m. ET. More performers will be announced within the coming weeks, the network said. Although Adele’s third studio album, “25,” was released to critical acclaim and massive sales, fans will have to wait until 2017 to see her sweep the Grammys because “25” wasn’t eligible this year. The Grammy eligibility period for the 2016 ceremony extended from Oct. 1, 2014, to Sept. 30, 2015, and “25” was released on Nov. 21. Previously, Adele won a total of 10 Grammys, and she is no stranger to performing during the event. 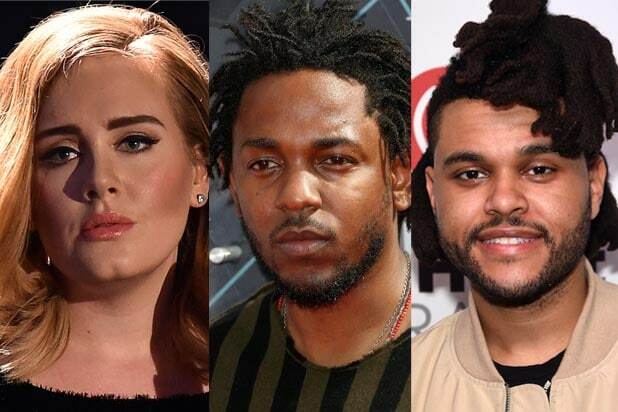 The Weeknd, however, will be making his Grammy performance debut this year. The breakout artist of 2015 is nominated for seven Grammys, including Record of the Year for “Can’t Feel My Face,” Album of the Year for “Beauty Behind the Madness,” and Best Song Written for Visual Media for “Earned It,” a song featured on the “Fifty Shades of Grey” soundtrack. "A Thanksgiving Miracle" For those times when politics and family drama threaten to tear Thanksgiving dinner apart, "Saturday Night Live" came up with a foolproof plan of action: Play Adele. Everyone loves Adele. Ken Jeong and Rob Riggle break up with NFC East In a "Hello" parody for "Fox NFL Sunday," co-stars of "The Hangover" Ken Jeong and Rob Riggle ape the teams of the NFC East, including the D.C. team for its "racist name." James Corden wants his trick-or-treating partner back "The Late Late Show" host James Corden did his own parody of Adele's hit as a lonely Chewbacca who phones his Han Solo trick-o-treating partner for one last Halloween. Ellen inserts herself into Adele's conversation Turns out the person Adele is calling to say "Hello" is actually Ellen DeGeneres, and the daytime talk show host finally revealed her side of the conversation. In the spoof, she also takes calls from Drake and Lionel Richie. Harrison Ford and Chewbacca reconcile their differences During the "Jimmy Kimmel Live!" episode dedicated to "Star Wars: The Force Awakens," Harrison Ford finally makes up with his estranged co-pilot with a little help from Adele. Lionel Richie/Adele mash-up With the title "Hello," Adele's single immediately reminded a few people of the Lionel Richie '80s ballad, including Richie himself. The singer posted a parody mash-up video to his Instagram account not long after its release. Miss Piggy covers Adele Following her break-up with Kermit the Frog, Miss Piggy channels the spirit of Adele in promo for ABC's "The Muppets" that aired during the American Music Awards. Taylor Swift vs. Adele: Which Music Star Won 2015?